It stands on the busy Muntplein square, near the flower market and the start of the Kalverstraat shopping street, where the Amstel river and the Singel canal meet. The tower was originally part of the Regulierspoort, one of the main gates in Amsterdam's medieval city wall. The gate, built in the years 1480-1487, consisted of two towers and a guard house. After the gate went up in flames in a 1618 fire, only the guard house and part of the western tower remained standing. 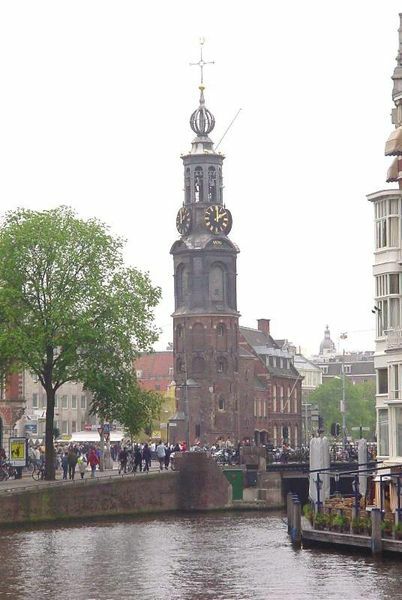 The tower was then rebuilt in Amsterdam Renaissance style in 1619-1620, with an eight-sided top half and elegant open spire designed by Hendrick de Keyser, featuring a clockwork with four clockfaces and a carillon of bells. The carillon was made around 1650 by the brothers Pieter and François Hemony. 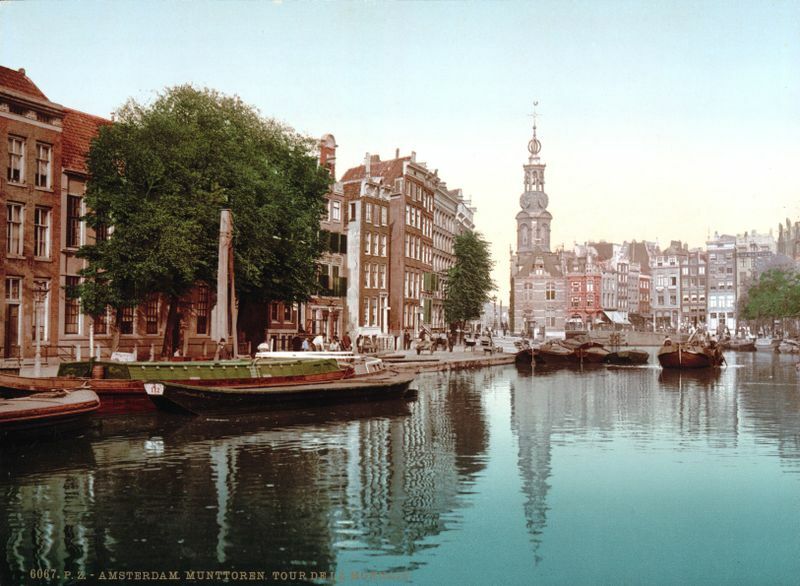 In 1873, the bells were sold for scrap iron, but were saved and are now on display in the Amsterdam Historical Museum. The current carillon consists of 38 bells (11 more than the original carillion had). A mechanism causes the bells to chime every quarter of an hour. On Fridays, between noon and 1 p.m., a carillon player gives a concert on the bells. The name of the tower refers to the fact that it was used to mint coins in the 17th Century. In the Rampjaar ("disastrous year") of 1672, when both England and France declared war on the Dutch Republic and French troops occupied much of the country, silver and gold could no longer be safely transported to Dordrecht and Enkhuizen (where coins were normally minted), so the guard house of the Munttoren was temporarily used to mint coin. The guard house is not the original medieval structure but a 19th Century fantasy. The original guard house, which had survived the fire of 1618 relatively unscathed, was replaced with a new building during 1885-1887 in Neo-Renaissance style. An underpass was added to the building during a 1938-1939 renovation. The Munttoren will receive new foundations to prevent it from sagging during construction of the Noord/Zuidlijn, the new metro line. The city has allocated 1.9 million euros for this purpose, according to a May 17, 2006 report in the newspaper Het Parool. Scale models of the tower are exhibited at Madurodam in The Hague and at Mini-Europe in Brussels.